This book comprises two parts. The first part deals with some aspects of wastewater treatment, encompassing various types of technologies for treating wastewater and evaluation. The technologies, biochemical as well as chemical, including evaluation of technologies are also discussed. Part 2 is on solid waste management. It includes both municipal and industrial waste management. 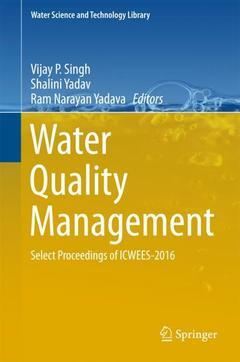 The book is of interest to researchers and practitioners in the field of water resources, hydrology, environmental resources, agricultural engineering, watershed management, earth sciences, as well as those engaged in natural resources planning and management. Graduate students and those wishing to conduct further research in water and environment and their development and management find the book to be of value. 1. Investigation on the Treatment of Combined Effluent Treatment Plant Wastewater and its Safe Use in Agriculture - A Green Technology Concept, by Singanan Malairajan.- 2. Evaluation of Treatment Technologies for Arsenic Free Drinking Water Supply,Disposal of Backwash Water and Exhausted Media in Bihar, India, by Astha Kumari.- 3. Simultaneous Removal of Arsenic and Nitrate in Anaerobic Batch Reactors by A.K. Shakya.- 4. Oxyanions Removal by Biological Processes: A Review, by Ranjeeta Bhande.- 5. Factors influencing electrocoagulation treatment of UASB reactor effluent by Abhipsa R Makwana., by Abhipsa R Makwana.- 6. Performance Evaluation of Filters for Sedimentation Particle Filtration, by Snehal Bantey.- 7. Magnetic Extracellular Polymer Composite for the Effective Removal of Microcystin, by Arivizhivendhan K.V.- 8. Bioremediation of Chromium Complex Dye by Growing Aspergillus Flavus, by Arpita Ghosh.- 9. Biosorption as A Novel Approach for Removing Aluminium from Water Treatment Plant Residuasl : A Review, by Mansi Mishra.- 10. Catalytic Oxidation of Sulphide Laden Tannery Wastewater Without Sludge Production, N. Prabhakaran.- 11. Treatment of Dye Wastewater from Textile Industry by Electrocoagulation and Fenton Oxidation: A Review, by Sandeep Thakur.- 12. Impact of Hydrocarbon Pollutants on Partially Saturated Soil Media in Batch System: Morphological Analysis Using SEM Techniques, by Pankaj Kumar Gupta.- 13. Kitchen Greywater Treatment in a Constructed Wet Land Microcosm Using Aquatic Macrophytes, by Abhik Gupta.- 14. Assessment of Aerobic Biodegradability for Vegetable Tanning Process Wastewater Generated from Leather Industry, by Abirami Balakrishnan.- 15. Biodegradability of Syntans using Ozonation as a Pretreatment Process, by Dhivya Priya N..- 16. Treatment of Synthetic Petroleum Refinery Wastewater in Anoxic Reactors at Varied Feed Phenol, by Subrat Kumar Mallick.- 17. Fluoride Pollution Abatement, by Payel Roy.- 18. Evaluation of Dolochar as a Filter Media in Slow Sand Filtration by Purushottam Das Vairagi.- 19. Removal and Recovery of Methyl Violet Dye from Industrial Wastewater by Liquid-Liquid Extraction, by S. Elumalai.- 20. Fenton’s Treatment of Pulp and Paper Mill Effluent, by Sumit Kumar Gautham.- 21. Treatment of Car Washing Unit Wastewater – A Review, by Sasi Kumar N.- 22. Efficient and Economical Application of a Spent Waste Adsorbent Cu2+ Loaded Poly (AAc-AM-SH) Superabsorbent Hydrogels by Reusing It for Adsorption of Phosphate ion, by Tripti Singh.- 23. Streptomyces Cavourensis Strain RD7 Mediated Decolorization of Aromatic Industrial Dye, by Riddhi Naresh Dholakiya.- 24. Rice Crop Growth and Rhizospheric Microbial Dynamics in Heavy Metals Contaminated Inceptisol, by Manoj Shrivastava.- 25. Studies on the Non-symbiotic Diazotrophic Bacterial Population and Efficiency of Nitrogen Fixation in Coastal Saline Soils from Sagar Island, West Bengal, by Arundhati Das.- 26. A Critical Study on the Applicability of Chheimer and Wilkins Equations for Non-Linear Flow Through Coarse Granular Media, by Ashes Banerjee.- 27. Numerical Modeling and Design of a Fishery Port Near Ezhimala Promontory, by Dhanya T.P.- 28. Management of Urban Solid Waste in Shimla a Case Study, by Zuneid Brar.- 29. New Trends for Waste Water Treatment and Their Re-Use Using Ceramic Membrane Technology - A Case Study by S. N. Roy.- 30. Biodegradation of Leaf Litter (Shorea Robusta) Under Aerobic Condition, by B.R. Hiremath.- 31. Using Conversations to Enhance Pro-Environmental Practices in High-rise Public Housing: A Comparative Study Between Mexico and Australia, by Aldape-Garcia, A.O.- 32. Environmental and Infrastructural Features of High-Rise Public Housing Buildings and Their Impact on Resident’s Practices for Conservation, by Aldape-Garcia A.O.- 33. Municipal Solid Waste Management with Uncertainty Analysis for Urban Cities, by Vinai Singh.- 34. Solid Waste Management Through Vermi- and Phosphate- Enriched Composting Techniques for Sustainable Agriculture, by A.B. Singh.- 35. Production of Asphaltene Binders from Solid Waste Generated in Leather Industry, by K. Patchai Murugan.- 36. Performance and Morphological Changes in Aerobic Sludge Biomass Under Stressed Condition Imposed with Copper(II) in Feed, by Abhisek Mondal.- 37. Four-Pronged Pre-Processing Approaches for Maximum Utilization of Raw Tannery Sludge by Earthworms, by Ankita Swati.- 38. Impacts of Pit Latrine Additives on Volatile Solids and E.Coli in Faecal Sludge, by Ednah Kemboi.- 39. Enriched Compost Production Technique from Water Hyacinth, by Arti Mathur.- 40. Smart Dustbins: An Approach for Sustainable Solid Waste Management in Smart Cities by A. C. Sati.